I’ve been around Rastafarians most of my life, from Jamaica to Canada to America. I never really agreed with their lifestyle, but I’ve always respected their sense of independence, which they probably inherited from the teachings of Marcus Garvey. This one particular statement Rastafarians frequently say is,” Come out of Babylon”. This phrase has always intrigued me, but I never put much weight on it until now. Rastafarians were one of the worlds most persecuted people, yet they’ve been overlooked in the classrooms and in history books, particularly in the Caribbean. Rastafari’s genesis was in Jamaica, it’s not a religion, but a way of life with no clear cut doctrine one can put their finger on. Most of them believe that Haile Selassie (former emperor of Ethiopia)is the prophecized Messiah of the Bible, or hold him in some other high regard. Rastafarians are typically identified by their dreadlocks, vegetarianism, reggae, and marijuana. Believe it or not Rastafari is ranked at the 22nd largest “religion” in the world, personally, I find that unbelievable, but I have seen them almost everywhere I’ve traveled in the world. I’ve even seen a Rastafarian shop when I was in Bali. In Rastafarians humble beginnings, they faced great oppression and suppression by Caribbean colonial governments, none of which I understood until now. In Jamaica, the colonial government ordered Rastafarians randomly arrested, many were beaten, forcibly shaved and their houses destroyed. In Dominica the anti-Rastafari sentiment was much worse, an act passed in 1974 stated that individuals wearing dreadlocks and who appeared in public were guilty of an offense and subject to an arrest without warrant. The Act protected any civilian from civil or criminal liability who killed or injured a member of the Rastafari who was found illegally inside a dwelling. Additionally, the security forces received immunity from the law for killing members of the Rastafarian movement. One has to think, why the hell would the powers that be strike down so hard on a people who just want to live in peace, live on their own and “out of the system”. But you see that’s the key, “out of the system”, or as the Rastafarian would say,” Come out of Babylon”. This one little statement means so many things, it’s truly multidimensional. Here is a very informative interview with an elder Jamaican Rastafarian on youtube. 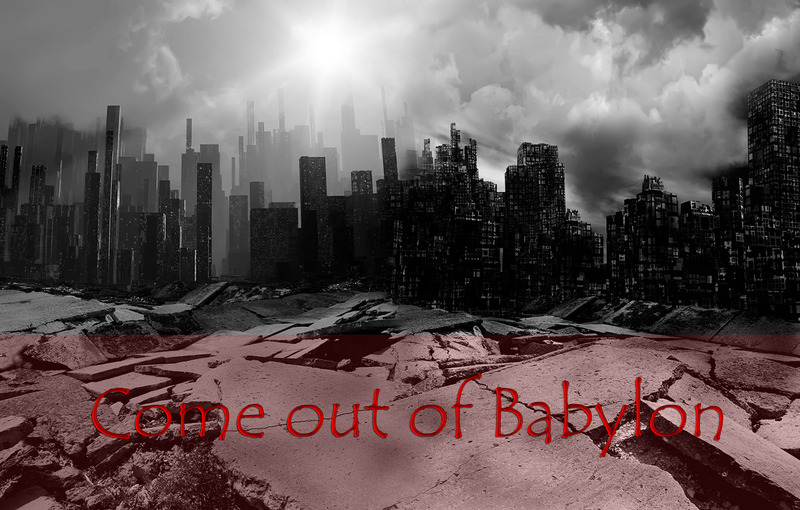 I will attempt to outline the various meaning of “Come out of Babylon” below. I now know why the Rastafarians were viewed as a dangerous threat to the state, even more so than a guerilla army. The early Rastafarians grew their own food, drank filtered water from the river, built their own residences, practiced bush medicine, and shunned money. An oppressive government or system where people are being made to work until they die to enrich the rich (like what is happening today in America) cannot exist if people refuse to participate in the system. It’s actually more detrimental to the oppressor to not participate in it, rather than trying to fight it. Decades before people became aware of GMO’s, deadly pesticides, and harmful chemical food additives, Rastafarians understood the need for food security. They wouldn’t buy food from grocers or anyone, they would plant their own food in the hills of Jamaica and eat what they reaped while selling or bartering with what hey had left over. Their argument was they had no idea what kind of possible chemical fertilizers or pesticides other growers were using, and they wanted pure food from nature and knew disease would result from foods tainted with the fertilizers and pesticides. They were obviously right, as the food source is now slowly killing the people. With the skills they acquired Rastafarians would build their own residences in the hills of Jamaica. Today we buy houses with a mortgage, and the system requires we pay the mortgage over a 30 years period, at an interest which makes us pay the loan at least three times over. Why do we have to pay the loan over a 30 year period? It’s like we are “buying” back our freedom from slavery, but only after the best and most healthy part of your life is gone, being it was dedicated for 30+ years making corporations and the rich richer. Rastafarians understood this “Babylon system” and refused to be a part of it, instead choosing to live their lives in nature, rather than of leaving their home in darkness and returning to their home in darkness just to pay bills, while executives are off to their weekly golf outings in Fiji. To the early Rastafarians, money was something they believed could not exist in their livelihood. They had the belief of “render unto Ceasar what is Ceasars”. They believed that if they used money, they would have to get into the Babylon system to maintain it, so they abandoned it. I don’t agree with this, as you can create your own microsystem in the system, much like how the rich have carved out a segregated privilege. I still don’t agree with some of the Rastafarian beliefs of how to live, but I do agree in principle with much of their beliefs and perceptions. Ultimately I believe for humanity to survive, we need to rebuild civilization. For instance, The American food source is poison, that is why Americans are by far the sickest people on the planet. The FDA is totally controlled by American food corporations and they basically “self-regulate” themselves. I believe the Pharmaceutical industry & the Corporate food industry are owned and controlled by the same interests. I believe that the corporate food industry is purposely making us sick with the GMO’s, pesticides, harmful chemical food additives, and processed foods to get us in a revolving circle of “eat to be sick”. Thereby making money on what we put in our mouths, while also making money on the drugs they’re spoon feeding us. The food corporations in America have spent millions of dollars lobbying against GMO food labeling. But to me, that is just one piece of the puzzle, I think the pesticides in some instances are worse than the GMO’s. The European Union has banned pesticides like neonicotinoid pesticides(harmful to pollinators), which are still legal in the US. I believe that many corporations in America and some parts of the western world have never evolved out of the philosophy of slavery. In some instances, many of the corporations are the same institutions that existed since the slavery era, like Chase Bank. For instance, in America, defined pensions are gone, except for executives, they’ve sold people on 401k’s, basically meaning you are going to work until you die. Worse, once you’ve been with a company to long, and making to much money, they outsource you for younger workers who are willing to join the system to do the same work for far less money, leaving you out on a limb. In time the same thing will happen to those younger workers too. In the west, we are overworked, overtaxed, and literally have no representation in government, not just in America, but where ever corporations control the politicians. Ultimately we need to rebuild society outside of harmful cities we live in. The unnatural concrete is disconnecting us from the healing energy of the earth, while all of the electrical and telephone wires block us from the light of the stars, effectively quarantining us. Their food and drugs are killing us, and no one is asking the questions as to why American women are all of a sudden getting Hypothyroidism(withint the last six years), why American autism rates for males are increasing every year, but we don’t see this trend in any other country? Why is there a CVS and Walgreen’s on every other corner? We are living a life of prescription drugs, addiction, and premature degenerative aging. The highest cancer rates in the world are all in the western countries including Europe. The food, the pharmaceutical drugs, the buildings, the fossil fuels, the stressful work-life of Western civilization is killing us. We need to unlearn what we have learned, we need to learn from the Rastafarians. We need to start building our own communities and cities, we need to build companies that are not parasites to nature or people. We need to control the source of our water, we need naturally occurring alkaline water, the chemical chlorinated water is harmful to our health. We need to free humanity, from corporate energy dependence, green or fossil fuels. We need to have a true free market, not a fake one controlled and skewered by corporations to kill out the competition. We need free energy, not an energy source whether green or fossil that is controlled by corporations, but an energy source that can be controlled and sourced by the individual, much like in the movie Star Wars. Whatever ideally Atlantis was, we need to rebuild it, but better. But all is not doom and gloom, we have started small organic farms, naturopathic medicine is being popularized, people are creating micro-economies, people and earth “friendly” companies are forming. But we need to accelerate this, we need to network and unify, we need to take it to another level in creating whole new fossil fuel free communities and cities, where people can own houses without slaving for 30 years, where people can work and not live check to check, where people can buy pure organic food, where people can buy medicine that is not addictive and harmful without it costing an arm and a leg. If we do not do this, eventually people are going to become real cattle, not just like the old dude you see working at Walmart as a greeter. The goal of the Corporations is to kill your brain with malnutrition and drugs, making you stupid and incapable of intelligence, while ultimately turning you into unresponsive cattle. We can all start on an individual level by educating ourselves about health, about where we spend our money, and supporting businesses, farms and people who are striving towards the same goals. Because of the internet, we have access to knowledge we didn’t have just 10 years ago, we are truly in the golden age of enlightenment. There are Books that I traveled to India to find in the ’90s, such as the Siva Samhita, that we can now download in 2 minutes. We all need to find our niche and read and develop new technologies, new ways of cultivating food, and inner-engineering etc. All of us are scientists in our own right, let’s take an individual initiative and see who is going to be the new Nikola Tesla, the new Dr. Carver, or even the new Imhotep. The knowledge is no longer locked and hidden away in the Vatican archives, or in the Libraries of Harvard and Stanford. There is more than enough knowledge out there on the internet for us to educate ourselves, so we can create a technology revolution that free’s humanity!